The second Expense Manager app in our roundup, from Markus Hintersteiner, is a fairly simple budget app that offers some good features but doesn't have the range of features that competitors like AndroMoney and Expense Manager by Bishinews do. Markus Hintersteiner's Expense Manager offers a very simple entry method (left). Its History screen lets you see past expenses, with the categories accompanied by icons (right). The app opens on an Overview screen that offers a line chart illustrating your weekly, monthly or yearly expenses; you can set it up for one of the three. The standard Android plus sign in the lower right corner lets you record an expense amount. The entry screen starts with a pop-up number keypad; once you've recorded the amount, the pop-up disappears and you can then choose a category for your entry, change the date (the default is "Today") and type in a freeform note. Each time you save an expense, the app goes back to the Overview page, and you have to hit the plus sign again to enter the next one. Hintersteiner's Expense Manager doesn't offer as many options for categorization as some of the other apps reviewed here. You can add more categories if you want, but because there are no subcategories or tags, you have two choices — either use the Notes field (to, say, differentiate plane fare from gasoline expenses under Transportation) or to create a large number of categories (for example, make Plane Fare and Gas their own categories), which could get unwieldy. Besides the Overview screen, there is a nicely formatted History screen that lets you see all your past expenses (also by the week, month or year). You can filter the screen by category and export an Excel report from the setup manager. In the Settings screen, there are a number of other tweaks you can make: You can choose a currency and opt for a daily reminder to enter your expenses. You can manually back up your data by sharing it with whatever services you have on your phone and set a lock pattern for extra security. You can also watch your spending via a budget page, and set up expenses or income that repeat on a regular basis. 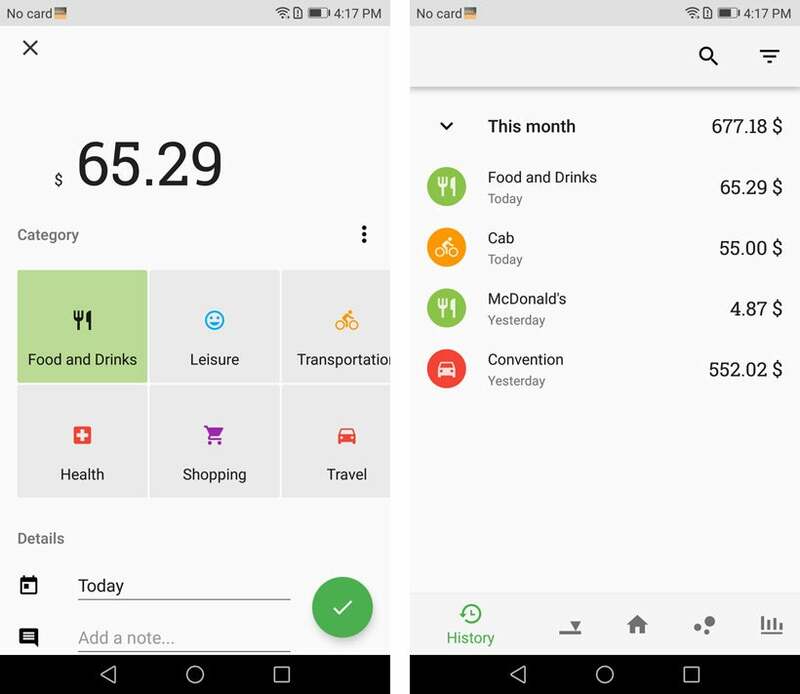 For a one-time payment of $2.60, you can get three additional features: analysis of your expenses by category, analysis by time frame and automatic backup via Google Drive. There are no options for taking photos of receipts. Markus Hintersteiner's Expense Manager is simple to use and could be a good app for personal budgeting; however, it's a bit too limited to be used for any but the most basic expense reporting. Expensify is a cloud-based expense tracker that offers personal, small business and enterprise-level versions with a wide variety of feature sets. The Free version (the one I reviewed) offers five SmartScans (scans of receipts) per month, expense reports, unlimited receipt storage and the ability to categorize and tag entries. The $5/user/mo. Team plan adds unlimited SmartScans, basic expense approvals for businesses and ACH reimbursement, among others; the $9/user/mo. Corporate plan adds more functionality, such as corporate card reconciliation (which matches receipts to credit card statements) and custom reports. There is also a custom Enterprise plan. Expensify scans the data from your receipt and drops it into the appropriate fields (left). A summary screen includes the scanned images — including the occasional failures (right). Since Expensify is a cloud-based application, you have to sign up to use it. According to the site, the company uses "bank level security" to protect user data, including HTTPS+TLS data and password encryption. You set it up with the help of a computerized "Concierge" that asks if you want to submit receipts (if you're an employee of a company that uses Expensify), collect receipts (if you're a company manager or accountant) or track personal expenses (for individuals and sole proprietors). Since I wasn't going to submit my expenses to anyone, I chose the last. You are then guided through the process of selecting a password, connecting to a business email account (if you have one), using your location to track mileage, and scanning your first receipt. A neighborly message from the Concierge assures you that it's now taking care of everything. From then on, the app will open at your Inbox, which shows any outstanding tasks waiting for you. In the top right corner of the screen, a large plus sign lets you add a new entry; tap on it and you get three choices: Distance (which lets you track how many miles you've traveled, either using GPS, your odometer or manually); Time (which lets you set an hourly rate); or Expense (allowing you to create a new expense with or without a receipt). Upgrades: Team plan ($5/user/mo.) adds unlimited SmartScans, basic expense approval, ACH reimbursement and other features. Corporate plan ($9/user/mo.) adds advanced policy reinforcement, corporate card reconciliation, custom reports, other features. Enterprise plan available. If you choose to create an expense without a receipt, you can fill in fields for a merchant's name, the expense amount, the date, a comment, a category and a tag. You can also add any other attendees (if you're paying for a group meal) and log the expense as reimbursable. If you choose to create a new expense with a receipt, Expensify will automatically use SmartScan. You can also immediately use SmartScan to scan a receipt by tapping the camera icon in the lower right corner of the Inbox. When I tried Expensify with two receipts, it worked well — for the most part. Although the photo it took of a McDonald's receipt looked very dark, the information popped up in my list of expenses almost immediately, and the date, price and merchant name were filled in accurately. A more complicated hotel bill failed the first time; but the second time it took about 10 minutes to scan and then record the data correctly. But wait, there's more! Click on the three parallel lines at the top left of the Inbox, and you have four other choices: Expenses, Reports, Trips and Settings. Expenses leads you back to your list of current expense entries. Settings offers a few tweaks to the app, such as the type of currency being used, whether you have access to offline mode and whether you want to upgrade. It also allows you to edit your categories. When you create a new report, you choose which expenses you want to include from your current list. Once you've finished adding expenses, you can email the report to yourself (or to anyone else); the report arrives as an attached PDF file (which can be previewed before you send it) that includes any scanned receipts you may have added. 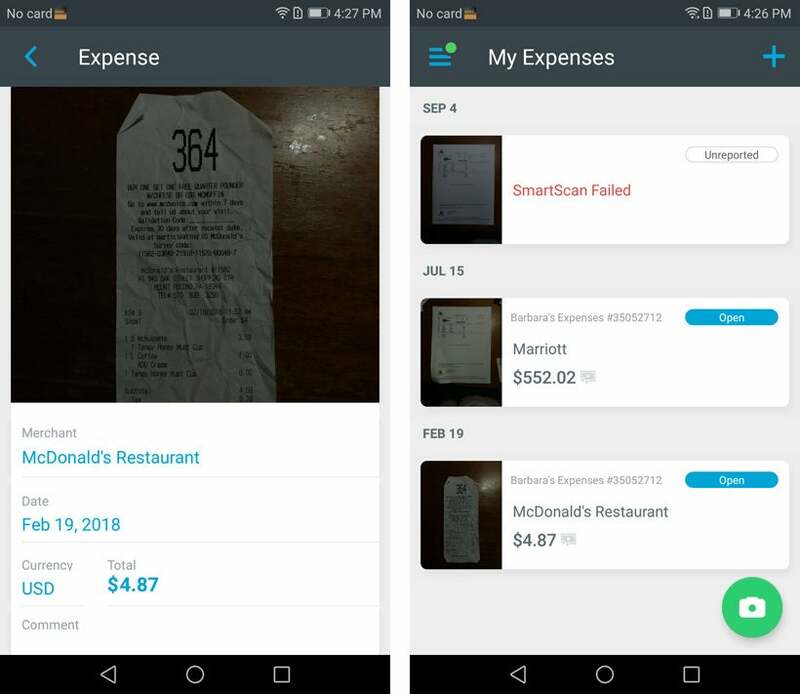 Expensify is an excellent professional expensing app that works best for companies whose employees have to track their expenses and arrange for reimbursement. Individuals may like playing with SmartScan, but unless they are willing to pay the $5 per month, they may want to go with one of the less business-oriented apps. Hello Expense is a nicely simple expense tracker that, while not on the level of something like Expensify or AndroMoney, has enough flexibility to suit individuals. I've used it for several years to track travel expenses. Hello Expense has a very simple interface that allows you to add new expenses quickly (left). You can use color-coded tags to organize your expenses (right). When you open the app, you're dropped immediately into an entry screen for the day's date. You can change the date, choose a category from a drop-down menu, write in a freeform memo and select a color-coded tag. Right below the tags, there is a large calculator for entering the expense amount. Hello Expense is a bit different than the others here in that you don't have to hit the period for your cents; you just type in the amount. If you're putting in a whole-dollar amount, you can simply hit the "00" button on the calculator to add zero cents. When you're done, tap the Save button at the bottom. In order to set up, edit, delete or add categories, you have to go to the Settings screen (which is accessible from the three-dot menu on the upper right corner of the display). You can, however, add a new tag directly from the entry screen, and can assign as many tags to each entry as you wish. Your recent expenses are listed under the calculator. You can tap any entry to edit it or delete it; you can save the edited expense or copy it to a new entry (allowing you to, for example, quickly enter a series of similar expenses). To see all your entries, you tap the arrow to the right of the bottom Save button. A pop-up menu then invites you to do a search, see all your entries or filter by category, day, week, month or year. You can also filter by tag, but only once you've chosen your initial search — so, for example, you can choose to see all your entries, and then, once you've got the list, filter it by choosing your Sales Trip tag. 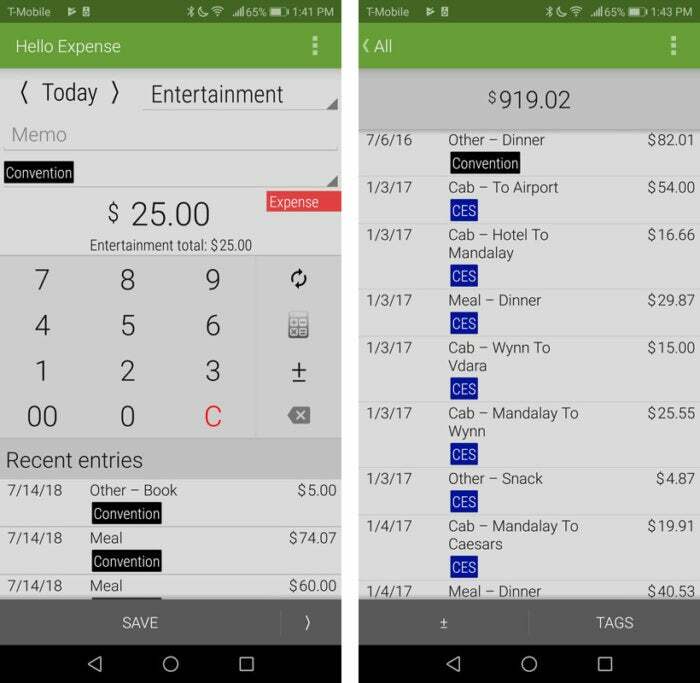 Hello Expense would be nice for business use if there were a way to add receipt photos; however, it remains a relatively simple but useful app for individuals who want to track their personal expenses. If all you need are the basics, Hello Expense remains a simple, solid way to track expenses through your day. Expense Manager (Markus Hintersteiner's version) is also easy to use, but its limitations on categorization could be an issue for business users. If you're looking for something you can mold to your individual needs, AndroMoney and Expense Manager (Bishinews) are both excellent and flexible apps with a good number of options. I'd try either or both to see which suits your needs best. For more heavy-duty corporate use, both Abukai and Expensify offer much more technologically sophisticated solutions for individuals, along with a wide range of enterprise-level options. This article was originally published in May 2015. All apps were retested and their reviews updated in October 2018.